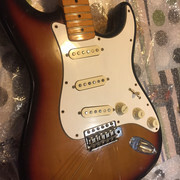 Tokai Forum - a subsidiary of TokaiRegistry.com :: View topic - Greco SE500 1978 pickups? Posted: Thu Oct 26, 2017 11:45 am Post subject: Greco SE500 1978 pickups? I'm new to the forum. Just bought my first MIJ guitar - a Greco SE500 from 1978. Just got it and it is in amazingly good shape for a guitar almost 40 years old and plays extremely nice. 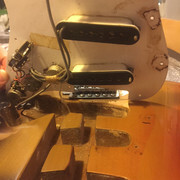 Being curious I - of course - had to take a peek under the pickguard. From information I on diverse online forums it seems like the SE500 from 1978 should have Maxon Excel pickups. The PUs in my guitar are white with a black bottom. But there are no markings on the underside of the pickups and no visible text "Excel". 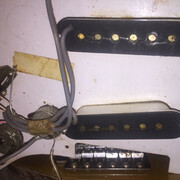 So I'm wondering what pickups these are? From the looks of them and the fading of the white plastic they sure do look like they are the same age as the guitar. The wiring/soldering looks pretty old as well. Seems to be lot of knowledgeable people around here so I thought I would try to see if anyone has an idea of what they are? Hi !! I have a '78 SE500 that is pretty much identical to yours although its in Natural instead of sunburst. Mine did have the excel marked pups. I lent my multimeter to a friend who was having electrical problems in his car but i'll have it back soon and see what my Excels measure. They have the identical grey wire. Does your guitar have a 3 way switch or a 5 way ?? These originally came with a 3 way. Hi! Would be great if you could measure your pickups. My guitar has the 3-way switch. Thanks. Resistance values around 5-6 kOhms seems in line with what I have seen other post for the Excel pickups. That is why I think my pickups that measure >8 kOhms might be something else. I tried sending an email to maxon.co.jp to see if they had any ideal what pups could be in my guitar..